Give your pup a long-lasting treat that packs the best of both worlds when it comes to chewing and snacking. These filled bones provide the chewing factor dogs crave on the outside, and a deliciously peanut-butter flavored filling on the inside. They’ll stay busy licking up the tasty goodness within, and then chewing away on the bone. All that gnawing helps satisfy dogs’ instinct to chew while supporting dental health. They’re made in the USA with USA-sourced ingredients, and never any artificial colors, flavors or preservatives. Two-in-one, long-lasting treat—a bone to gnaw on and a tasty, soft filling on the inside. Lip-smacking filling is made with delicious flavors dogs love like peanut butter. Provides lasting chewing satisfaction and licking for the tasty filling. Delivers the chewing satisfaction dogs crave, and helps support dental health. 100% sourced and made in the USA, with zero artificial colors, flavors or preservatives. Filling: Chicken Meal, Cane Sugar, Molasses, Vegetable Glycerin, Water, Rye Flour, Rice Flour, Natural Peanut Butter Flavor, Citric Acid (Preservative), Buffered White Distilled Vinegar, Mixed Tocopherols (Preservative), Rosemary Extract. Feed as a treat. Pets should be supervised when chewing treats. Discard any small pieces that may break off to avoid choking. Always provide a fresh supply of drinking water. USA Bones & Chews are crafted to deliver the lip-smacking chewing experience dogs love. They're hand trimmed and slow roasted in their natural juices to retain optimum moisture levels and that rich taste your dog can't resist. With a range of dog-approved options such as antlers, hooves, bones or ears, burger patties and filled treats with the tasty flavors of beef & bully and peanut butter, you will always find the perfect treat to indulge your pup. You've heard of a superfood before, but have you ever seen a supertreat? These tasty chews and patties are just that. They deliver a naturally delicious source of protein and the taste that keeps dogs coming back for more, with beef, chicken and peanut butter flavors. There are never any additives, chemicals or artificial preservatives. Just a rewarding, protein-rich dose of chewing satisfaction. We put USA right in our name, because we want you to be able to trust what you give your dog on the daily. That's why we make treats that are proudly sourced in the United States, and after sourcing, they're made here too. This ensures the highest quality and safety standards, so you can be confident anytime you treat your four-legged family member. 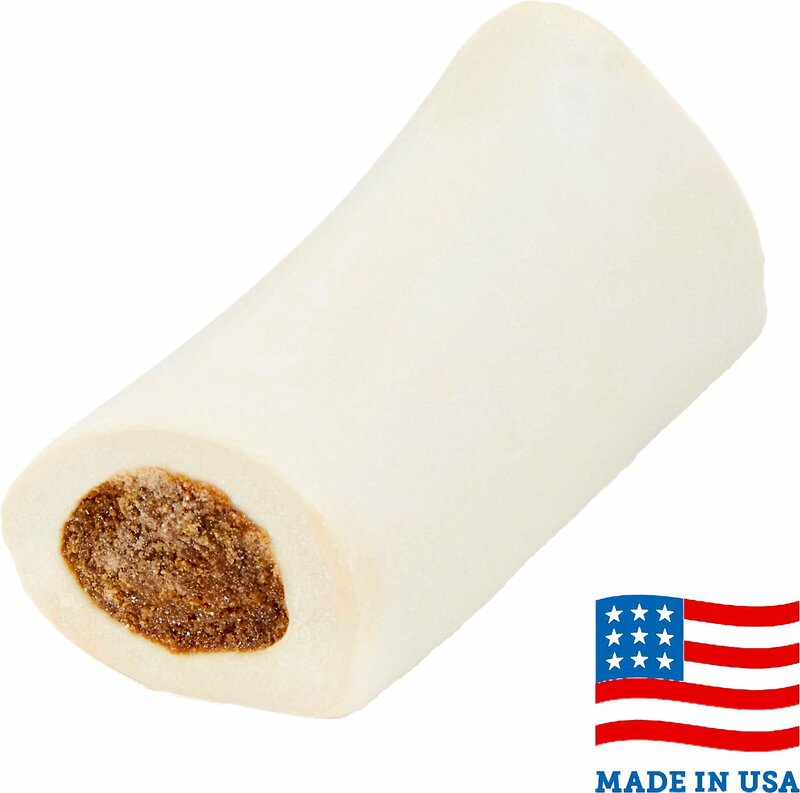 Depending on your dog's size and chewing strength, there's a USA Bones & Chews treat just for her. These dynamic treats are available in a variety of shapes and sizes to perfectly pair with your pup. And there are even rope toys strung with treats that up the ante on fun. USA Bones & Chews is dedicated to delivering the most rewarding treating experience for dogs and their parents. Ingredients are sourced from reputable suppliers in the USA, so you know you're getting the finest quality and unbeatable safety. Their treats are all natural with no fillers—just delicious, nutritious, beneficial goodness that's made in the USA. My Pointer is a chewer and there aren't many things she can not chew through. This so far does the trick. She likes the inside treat, too. Only problem I have is it's so heavy that when she drops it on my tile floor, I'm afraid she's going to crack it one of these times. So far so good. Bought them for my big pit. He isnt AS interested as I thought he would be but I think in time they will do the well! Its a good size and price! Peanut butter inside is a little weird looking and odd smelling- thats the only ‘bad’ thing I would say. Highly recommend to entertain your pup for a while! Two paws up from Madi! My golden, Madi, went bananas over this bone. I can’t get it away from her! My dog is about 50-lbs and this was a good size for her and kept her occupied for a long time while I was cleaning house. You definitely want to make sure you supervise your pup when they have this, as I heard her chip a small piece off of the edge and it made it a little jagged, but I hit the edge of it on a counter a couple times to round it out and she was back to playing with it again. I’ll definitely order another one once she’s gotten all the PB out of this one, it’s really the only thing I’ve found so far that keeps her entertained for this long! My 15 pound Maltipoo loved this bone. He begged for it everyday even though it was a little big for him when it came. He learned to turn it to get the peanut butter from both ends. My only complain is that after about a week the bone broke completely in half and now I have to watch him every minute he chews on it to make sure it doesn't break again and cause him to get choked. My two huskys love these bones. It's a good way to keep them busy for awhile, and they take them everywhere with them! My year old Lab who chews everything just loves this treat! Keeps him busy and entertained. Love getting all his needs fulfilled by Chewy. These bones were a little too large for my Australian Shepherds. They enjoyed the bone until they got the soft stuff in the middle and then they abandoned them. I think these would be better for larger dogs like my Akita or dogs weighing more than 100 pounds. My Pups loves these filled bones! My dog didn’t care for this one. I usually get the chicken filled bones and my dog goes crazy for them. He loves peanut butter as well, but for some reason he didn’t care for this bone whatsoever.